“I am shocked,” she told me. She explained that her family was having financial difficulties and needed to reduce their cable bill. 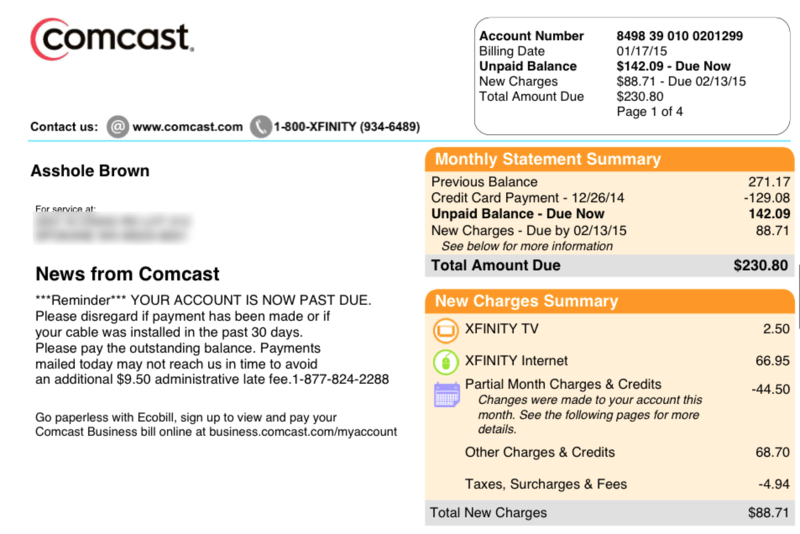 She’d called Comcast to cancel the cable portion of her account, for which she had to pay a $60 fee. Instead of complying immediately, a representative escalated her call to a retention specialist, who tried to persuade her to keep the cable service and sign a new two-year contract. My first thought was that someone was trying to pull a practical joke on a consumer advocate. So I asked for a copy of the billing statement and the correspondence between her and Comcast. And no kidding, it looked like someone had changed the name. How impolite! Next, I contacted Comcast to find out what its records said. It’s fairly easy for any customer to doctor a photo of a bill to shame a large company, so I wanted to make sure Comcast was seeing the same thing. Elliott updated that Lisa Brown had contacted him to confirm that Comcast had “made it right,” offering a full refund for the past two years and two extra years of service at no charge. It’s certainly not a shock that some customer service reps hold differing opinions on customers, but I don’t think we’ve ever seen it come out in the public in such a blatant way. It’s laughable at this point.